This board is open for all subject matters. Post information and discussion materials about open-debate and censorship on other boards (including this one) here. Memory Hole 2 is a RODOH subforum for alternate perspectives. Yep Anne was 1.63m tall which is 5ft 3". This girl is taller than the other kids but certain shorter than the young man. Anne was about the right height for an average girl her age. It is possibly or even probably not her but I am looking at the bottom eye lids, the eyebrows, the shadow of the smile and the same kind of teeth. 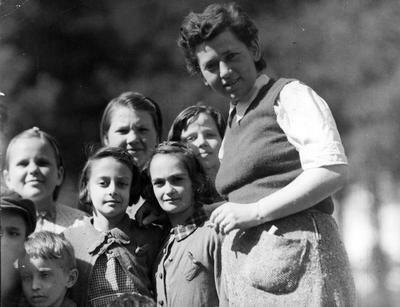 I find the resemblance uncanny Doesn't matter anyhow, those Belsen kids look happy either way for being in a KL. I looked again 24 hours later or so and find no differences between the Anne Frank in the files and the photo except for the hair differential. We had a meeting today and concluded we are 95% sure that the girl is the same in both photos. We are sure there is a high probability this is Anne Frank....NSDAP..seems no one else seems to care except us. We will keep her memory alive. A few issues are unclear at the moment. Some sources say the photo was actually taken by the British after liberating the camp. If that is so and that is really Anne Frank then her death by typhus while under the control of the Germans is seriously in question. Maybe the girl alleged to be Anne Frank is in the photo? I'd say that's her right beside the nurse in the reunion photo. This is a good indication that the original photo you posted, NSDAP, is a post liberation photo and therefore taken by the British. What do you think?... Her hair is done the exact same way, same clothes, etc., etc. Indeed, in the second photo you showed this girl is certainly not 5'3" unless the woman is a potential world class basketball player. So NSDAP, can we put this matter to rest? I'm certain that is NOT a photo of Anne Frank. Thank you for your help. Can anyone find the actual real birth certificate of this young lady: Anne Frank. Anne as portrayed to everyone was born Annelies Marie Frank on June 12, 1929, in Frankfurt, Germany, to Otto and Edith Frank. For the first 5 years of her life, Anne lived with her parents and older sister, Margot, in an apartment on the outskirts of Frankfurt. I and my mates wish to know if this lady ever really existed apart from the story. There is a growing suspicion this lady was never real. Diary was published in 1952. There were editions done in ball point pen. Advance the girl in the pic who was in BB photo taken say 8 years later and then publish a diary, a fake one as retrospective. We did aging on the young girl photo and advanced it 8 years: the photos are identical to the Anne Frank photo everyone is familiar with. Of course we could be wrong. This is how Intelligence Services of disinformation worked in those days. They had a program of de Nazification so the Ann Frank myth was created. Okay NSDAP. You're starting to get a little on the weird side. There is a fine line between Moledro and Necrophilia. Or would the word be "Pedo-Necrophilia" in this case? To an outsider it is starting to look like you have an obsession (amorous?) with the young Anne Frank. Not healthy. NSDAP wrote: Advance the girl in the pic who was in BB photo taken say 8 years later and then publish a diary, a fake one as retrospective. We did aging on the young girl photo and advanced it 8 years: the photos are identical to the Anne Frank photo everyone is familiar with. Of course we could be wrong. Advancing the girl in the BB pic (assuming we are talking about the Anne Frank doppleganger beside the alleged 7 foot tall woman) eight years in the future would be a portrait of this girl in 1952. The BB photo was taken in 1945 by either the British or someone accompanying the British. NOT the Geheime Staatspolizei as you stated previously. Where did you get that idea from anyways? There are no photos of a living Anne Frank (AF) from 1952. All photos of Anne Frank that are portrayed to be Anne Frank were taken prior to 1945. The diary was written (not published) prior to her being whisked away by the Evil Nazis. What are you saying here? Please lay out your logic in a rational format NSDAP. I am most certain the AF doppleganger is the same woman shown in the reunion photo to the left of the nurse taken 50 years later, i.e., 1995 that I showed previously. NSDAP wrote: I and my mates wish to know if this lady ever really existed apart from the story... There is a growing suspicion this lady was never real. There are a lot of photos of a young girl allegedly identified as Anne Frank. Are you saying they could be of someone else? 1. The BB photo of the AF doppleganger is NOT Anne Frank. 2. All reasonable facts and information show that there WAS a girl named Anne Frank of the told tale and photos alleging to be her. Anne Frank existed in fact beyond reasonable doubt. 3. Anne Frank along with Margot Frank died of disease in Bergen Belsen prior to its being liberated by the British. I understand the exact date and disease are in question. 4. The diary may be real, totally fake or embellished. I would suspect the latter. Thanks RtG embellished is the best option. Thank you for your time.